One of the most popular Feature Requests we've had is to be able to place symbols anywhere on the map (not just along the route) and to have a much wider choice of symbols. We've also had feedback that it wasn't obvious enough how to add symbols and labels to the route. Our latest upgrade aims to address this. You can now place symbols and custom labels anywhere on the map, by clicking on the new "Annotate Map" button in the bottom left corner of the route planner. 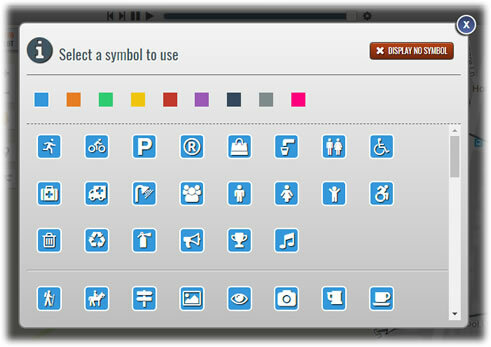 We've also redesigned and expanded the range of symbols - there now over 100 to choose from in a choice 9 different colours. We've chosen a selection of symbols that we think will meet most people's needs, particularly focusing on race directors and event organisers, who often need to show the location of important features like registration points, toilets/restrooms, water stations and parking. However, if you can't find a suitable symbol, you can still highlight the feature on the map with a custom text label, which can now be placed anywhere. ignore my comment, switching the site off then on again and the button was back. I LOVE the new annotate map function to place labels and symbols anywhere on the map!! I would like to use the symbols to highlight waypoints for written directions as they are hardly visible when printing the map. However, the numbered symbols only cover 1 to 10, is there any chance you could extend the number symbols to 30 ...??? I'm glad you like this feature Christine. My main concern about adding more numbered symbols, is that if we extend them to 30, someone else will ask for 40 and so on! I'm wondering if we can do something to make the labels more visible. They look quite clear to me but perhaps we could improve the contrast between the label background and the text. I understand. Yes, making the labels more visible would definitely solve my problem. The problem is that I print the maps in parts, eg. day 1 route might have 28 labels but I separate the directions in my route book in 3 parts. I have the map on the left and the directions on the right. For this I screenshot a section of the map (in print with browser view) that shows label 1 to 7 (as an example) on the first map, then 8-17 on the second map and 18-28 on the third map. I then crop and resize the screenshot to fit in the roadbook template. Because I downsize the map for this, the labels shrink, too, and therefore they're really small and hardly visible. I don't know, maybe it would be an idea to offer an option to show the labels in 2 different sizes, small (like now) and large ...?? Or even better to be able to highlight the labels in a bright color so they're better visible ...?? would it help you if I sent you an example (pdf)? I quite like the idea of offering more formatting options for labels (different colours and sizes). I've added this to our Feature Requests list (number 86) where people can vote for it if they'd like to see feature introduced. I think this would be a useful enhancement to the site, so it gets my vote!